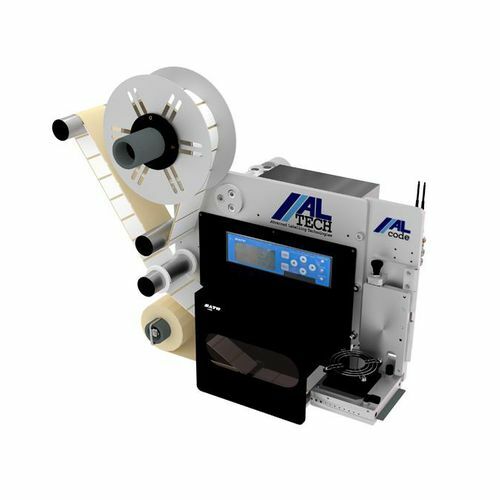 Alcode LT is an exceptionally geared printing machine that prints and applies labels in real time. It is equipped with the innovative SATO LT 408 printing system which enables the machine to print at an impressive speed of 150mm/sec at 200Dpi definition for labels of width 104mm. The printing machine is compactly built and therefore, perfectly suited to applications with space constraints. It is extremely cost-efficient too. Both features grant a high level of versatility and adaptability to an array of applications. In fact, organizations already using Alcode label printing solutions have replaced existing models with the Alcode LT in order to optimize space usage and reduce costs of operations. The machine is equipped with air jet application technology that efficiently handles irregularly-shaped products and is also useful in high speed applications. The labels are attached by a swinging roller for products moving at a speed on conveyors etc. and by a piston for unmoving products. The machine is controlled by microprocessors. Electrical and pneumatic elements work in tandem to power the machine and its 220 mm diameter unwind device.